NB: The following information is from 2005. Boat questions (hardshells or softshells?, rent or use your own?) are intertwined with logistics questions (how many people in the party? ; anyone driving up? ; if so can they carry boats? ; are you paddling the upper Back, the lower Back, or both?). Each determines the other to a large extent. This Appendix (boats) and Appendix B (access and egress) address these matters. But the availability and cost! of Charter Flights (Appendix C) is a third factor in your calculations. It will take you a while to sort through the various options, even with solid information. 2. Use a tripping boat; a whitewater boat with lots of rocker is uncontrollable in the wind. 3. If renting, insist on seeing the boat and paddles before getting on the aircraft; generally, wooden paddles are bad news unless of high quality. 4. If renting a softshell, insist on doing a partial assembly before getting on the aircraft. 5. If you plan to use hardshells, verify early in your planning that the aircraft can carry them; some planes can't, either internally or externally. 6. If dollars are important, consider that carrying a hardshell externally costs extra (about $150 to return one from mission island to Yellowknife, for example). 7. Do your homework before getting in touch with the outfitters (who don't always volunteer information). Yellowknife rental sources for boats (2005). I’m not sure that Air Tindi has its own fleet but it will sure provide access to boats. info AT bathurstinlet.com Phone 867 920 4330; FAX 867 920 4263. Rents both hardshells and softshells. Phone 867 873 6443; FAX 867 873 2741. There is no indication at the website that Narwal rents tripping boats; I've emailed them. sales AT overlandersports.com . Phone 867 873 2474; FAX 867 920 4079. Rents both canoes and kayaks for tripping. At last check, rental rates ran from $200 to $250 per week. The [Gulyas]-[Waldron] party rented from Boyd Warner ($1,000 for the summer) and exited at Gjoa Haven. Boyd got them back. If you can’t make such an arrangement, it’s your job to get them back. The farther down the Back you travel, the more expensive it is to get back to Yellowknife; check the numbers given in Appendix B: Access and egress. Again, hardshells are more expensive to get back than folding boats. Renting either a hardshell or a softshell at home has the advantage that you can ensure the boat is OK. Finding out up there that it isn’t is no fun. But if you deal with a reputable outfitter, you should not have a problem provided you heed the recommendations above. I don’t see that renting at home is a reasonable approach. This makes sense if someone drives up to Yellowknife. But then you would have to return through Yellowknife. We looked at shipping boats from Toronto to Yellowknife and back from there. This option has a minor disadvantage (you might not get them home until well into the next year) and a major one, expense. The cost to ship our 18' Nova Craft from Toronto to Yellowknife was about $650 (after much argument), and the cost to truck it back would have been about $300. We gave up. Comments: Trucking companies charge by floor area; return is cheaper since trucks leaving Yellowknife are largely empty. We looked also at shipping boats to Yellowknife and back from Baker Lake. At that stage in our planning, only a Single Otter on tundra tires was available in Baker Lake; it couldn't carry a boat externally (of course) or a hardshell internally. Without a float plane, we would have left the boats at the mouth of the Hayes, to be sledded in the winter to Baker Lake; from there they would have gone by boat to Chesterfield Inlet, by boat to Churchill, by train to Winnipeg and by truck to Sudbury, from where we would have had to get them home by personal auto. The return cost would have been way over $500 and so the total cost to get a boat up and back would have exceeded the rental cost for six weeks; we gave up and rented a boat in Yellowknife. As described in Appendix B: Access and egress, some parties save money by doing the tough slog up the Meadowbank or getting over to Gjoa Haven; still though, it’s expensive to get a boat back south from either Baker or Gjoa. Given that the cost of six weeks renting is about half the purchase price, buying a softshell makes a lot of sense if you intend to do several such trips. Boyd Warner is the only person we know with an Ally boat. Appendix D comments on PakCanoes. 1. Leave slack at the beginning and end of your trip both for weather problems and in consideration of the day-to-day problems faced by the operators. 2. Make allowance for the switch to northern time; be pleased if you get in or out on the day planned. 3. Remember that canoe parties are a very small part of the business done by charter operators. For one thing, they work with us about 2 months per year. Even during the summer though, most are busy with exploration companies, tourists, fishing lodges, etc that put a lot more money into their pockets than we do. 4. Use a reputable operator. Ask around (post at CCR, for example) before committing. I give the few payload figures that I have; the numbers are intended for preliminary planning only; neither they nor those given at web sites should be taken literally. Get the right information from your operator. 1. Payload figures found at aircraft web sites (Google "Twin Otter aircraft Canada" for example) apply only to short flights. For longer hauls, the amount that paddlers can load onto the aircraft is reduced by fuel needs. Example: The web sites for Air Tindi and Arctic Sunwest Charters both give Twin Otter payloads of 3,300 lb but we had only 2,200 lb open for our flight to Jim Magrum Lake. 2. Some aircraft come in several models; for example the payloads of the three Twin Otter models (100, 200 and 300) differ by 1000 lb or more. 3. Some outfitters have access to fuel caches created specifically to deal with payload problems. 4. The estimates given below are rough only. 5. It may be better not to know everything (ignorance is bliss). But, if it ever existed, the day is likely gone when the payload limit was met if the craft got airborne. 1. Neither are the prices quoted below (all include GST) to be taken literally; they were the best estimates available at the time (early 2005), but circumstances change. Eventually, the price of the flight is what you agree on with the operator. 2. You can't expect hard numbers months before the trip. Operators have a small profit margin and have to adjust their prices as fuel prices change; these fluctuate in the north too, not just at gas stations in the south. 3. Shop around, but beware of comparing literally quotes from different operators; they may have made different assumptions for the coming season or be in different stages of their analysis. If one paddler says that operator A is cheaper than operator B, you may well find another who says the opposite. 4. Some operators itemize charges (distance and per mile rate, landing charge, Nav Canada charge, fuel charges, increases from the previous year, ...) and some give only the total. You have to make sure that all costs are included. 5. Expect to pay a fuel surcharge if prices change. The food figure that we used, three lb per person per day, is likely excessive; you might be able to get by with two lb if you go very light. A rough average figure for a 3-week trip is 330 lb per person, including body weight, food, personal and boat gear, share of group gear and share of canoe. When a canoe is carried externally, its cargo weight equivalent is usually doubled. And there may well be a fuel surcharge. All this information is from 2005! The payloads and prices given below are much better than ballpark figures but don't take them literally. And yes, there are contradictions in the numbers, all the more reason not to take them literally. Air Tindi and Bathurst Inlet Enterprises offer float-plane access to the Back. Adlair and Old Town Float Base (both listed at the Yellowknife web site) don't serve paddlers (I phoned both); the contact person at the latter was helpful though. I didn't hear back from Wannecke (also listed at the web site) or Aylmer Lake Lodge. At last report Bathurst books aircraft with Air Tindi. We’ve dealt with Boyd several times and recommend him highly. We’ve dealt with Air Tindi several times and recommend them highly. NB: These are 2005 figures; expect to pay lots more. Why give them then? So that paddlers who can’t afford these prices won’t waste any more time. 1. $4,800 to $5,600 for a Twin Otter to Sandhill Bay or Sussex Lake. One payload estimate was 2200 lb, likely enough for six people, three hardshell boats (carried internally) or Pakboats, gear, and food for six people for three weeks. 2200 lb is not enough for eight people, four Pakboats, food and gear. 2. About $1,400 for a 185 to Jim Magrum Lake; payload is 450 lb. 3. Actual cost: For the Twin Otter and 185 flights to Jim Magrum Lake on 5 July, we paid $6,602 + GST or $883 per person. 1. $9,600 for a Twin Otter for six people, as above. 1. $3,500 for a 185 to pick up two people; the flight could bring in two fresh paddlers. 2. $5,300 for a Beaver; payload is 200 to 300 lb in. 3. $5,300 to $5,900 for a Caravan (baby?). Payloads are 800 lb in, 1100 lb out, enough to get two people in and four out. The aircraft can carry a boat externally. Refueling stop likely necessary. 4. $6,250 to $6,500 for a Caravan (grand?) to get five people out. Payloads are 1300 lb in, 1700 lb out. 5, $6,600 ($6200 if fuel drum can be carried in). Five, maybe six, persons out. Payloads are 1000 lb in, 1600 lb out. 6. $9,900 for a Twin Otter; six people, three hardshells and gear. 1. $7,500 for a Caravan; four people and two hardshells (would have to nest). 2. $12,800 to $14,200 for a Twin Otter; six people and three hardshells. Refueling stops likely necessary. Several people have tried unsuccessfully to arrange flights with mining exploration companies (who I guess like to keep secrets). Boris Kotelewetz (867 793 2905, no email or web site) has a turbine single Otter on tundra tires. Converting to floats is expensive and he doesn't do enough canoe business to make it worth his while (most of his business is with exploration companies). Of course he can't carry hardshell canoes externally. I doubt that he could carry one internally. 3. near the headwaters of the Meadowbank (where he dropped off Drought-Burton in 2003). He says that he can land almost anywhere dry and get back up. In 2005, the cost for a Single Otter pickup at the mouth of the Hayes was $4,643 +GST = $4,968, independent of the number of paddlers (up to seven, maybe more). He has taken canoe parties with folding boats. Other parties have had canoes taken out in winter (by sled I guess); he flew them to their boats in the spring and they paddled back to Baker Lake. He picked up the Drought-Burton hardshells of 2005 from the mouth of the Hayes and got them to Baker Lake. Boris was very accommodating regarding the aircraft switch and charged us only the cost to him, $5,577. This is all very informative and valuable information. I am intrigued by your comment that you would not do this river again, and wonder if you could elaborate a bit? Most of us, of course, wouldn't think of paddling a river like the Back twice, but I assume you mean that you found the river a less rewarding experience in some ways than other barrenland rivers you have paddled. What was it about the Back that made it so? I ask because I have been intrigued by this river since I was a kid, when I first read Back's book. It seems unlikely now that I will ever get to paddle one of the big barrens rivers, but if I do I want to make sure I pick the right one! So it would be useful if you could tell us what it is about paddling this river that makes it so different from the other ones you have done. Thanks again for this excellent report. It was a highly rewarding trip, perhaps the most so. But I found the Back too dangerous, likely because we had very high water. Hawk was easy (side channel open) and some minor rapids were washed out, but Rock and Escape were really bad. Several times I had the feeling that we were on the edge. And a dump would have meant a long, cold swim, perhaps loss of the boat. Maybe I would feel differently if we had had lower water. Otherwise, it was a glorious trip. Best wildlife I've seen in any of my north of 60 trips (herd of maybe 4,000 caribou walked right past our tents, so many wolves we stopped pointing them out to each other, close encounter with one wolf trotting past), great scenery, wonderful companions. And I love the barrenlands. What a feeling of space, of being able to see almost forever, to breathe fresh air, to be away from the city, to know that there are likely no other people within maybe 100 km in any direction. But you can get all that on other barrenland rivers like the Thelon, which are less dangerous. Actually, the Thelon is my favourite, for it was my first in the barrens. 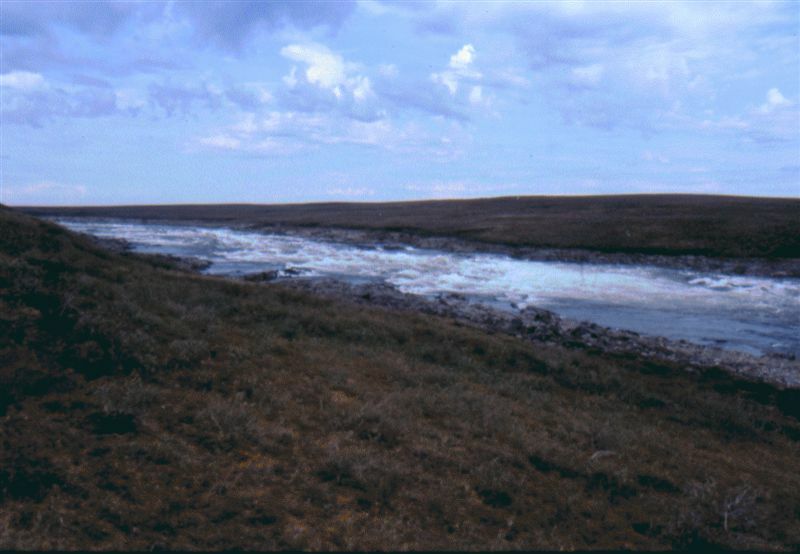 I recall vividly standing atop an esker in that special light, with not a tree in sight, just a vast open space with a herd of muskoxen in the distance, and with fields of clear, blue water here, there, everywhere. Please take note of Allan's sig line. Oh man do I agree with all this. It makes my heart jump just thinking about it. The Thelon is magnificent. This summer I paddled the Horton and I have to say it too was glorious. I hope some day I can get up there again. But even if it never happens, I have memories - wonderful memories. Please note that much of the information in the appendices comes from 2005. The best article I know of is Bill Layman’s Canoe gear for the subarctic. We borrowed George Drought’s Tundra Tunnel (Mk II or III); thanks for the loan! Eureka sells the commercial version. It holds 8 people comfortably, and we had 10 in it for several nights when Hans and Hans joined us. It really takes a lot of bite out of the barrens. I suggested sending it back from Mission Island but was really glad later that the other three on the lower river voted me down, for the weather got a mite nasty the last few hundred km; we got away with putting it only 2/3 up. We had two cans of spray, two sets of bangers and Bob’s 12-gauge shotgun, with slugs. Again, thanks to Levi Waldron for getting the spray and bangers to Yellowknife for us. Several of us had POL/PAL certificates; we practised at Bob’s cottage. On the upper Back, we had an Esquif Canyon (rental) used by Gene and Bob, and three PakCanoes, one 165 and two 170s. Our plan was to send the rental back from Mission Island with Daniela and Doug, whose 165 would be used on the lower river by Gene and Bob. Gene and Bob returned from Mission Island with the rental and the 165 and we paddled the lower Back in the two 170s. We put them on in the morning of the first day and kept them on until we finished the trip. They were essential in Rock (we would have swamped without them) and likely saved our bacon other places too. And they help keep you warm and dry. 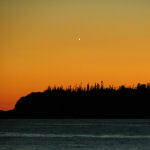 Though connections were fragile, Marilyn’s Globalstar proved invaluable both at Mission Island and at the end. We had Stephen’s MSR and we bought a two-burner Coleman in Yellowknife. We had 5 cans of fuel for the upper Back and 4 for the lower. The figure I use is 100 ml per person per day. We were in good shape here; Marilyn had the right stuff and Gene is an MD. I believe we all had paddling gloves, but some of us found them insufficient. I had brought some ski overmitts; Daniela and Doug used plastic bags. Most of us used our pump/filters. The others thought we were crazy; we reciprocated. The coffee filters I brought along in case the water got silty or otherwise messed up were utterly useless. Daniela Kosch and Doug Bell bought their 165 in 1999, I believe. Telephone: 514 704 9836. FAX: 450 922 1245? Paul went well out of his way to be of service and we recommend him highly. Mary and Jan Edick bought one long ago. So did Bev and Joel Hollis. George Luste bought one. Most comments I’ve seen or heard are favourable. Everyone I know who owns a PakCanoe is highly pleased with it, but I know some non-owners who don’t like them. Several of us (I was one) thought initially that people were crazy to use folding boats on the big northern rivers but we changed our minds. It was paddling the Horton with the Edicks that convinced me. On the Back, they handled big water better than any hardshell I’ve paddled. They flex going over big ledges (whereas a hardshell submarines); they flex the other way in roostertails (whereas hardshell gunwales go under). Some rapids we ran on the Back would, I think, have swamped almost any hardshell, even with spray covers. They track well on windy lakes and turn reasonably well in rapids; I’ve noticed little difference in these conditions compared to a tripping hardshell similarly loaded but then I’m no expert in boat handling. They are however noticeably slower on flat water, less than 1 km per hour I believe. They cost more than a good hardshell. They saved us a bundle of money (hundreds of dollars) and lots of trouble getting into and out of the Back. The Edick’s did the same on the Horton. Doug and Daniela's paid for itself several trips ago. As I discussed at length in Appendix A (Boats), it is both difficult and expensive to use hardshells on the Back, and in fact on many other northern rivers. Storing them is far easier than storing a hardshell; I keep mine is in the spare bedroom. They are obviously not as tough as hardshells but they got us down the Back with only minor damage. Marilyn bent some tubes in true Malley when she hit some rocks. I bent some later, lifting a loaded boat by the stern to get it over some rocks. The sides are delicate though and have to be protected when, for example, loading below rapids. The bottoms are very tough and the boats stand up well to dragging. The Edick boat did so on the Horton; Daniela and Doug have had no problem with theirs; Bev and Joel Hollis report only minor damage, easily repaired, from dragging on the Hood http://www.pakboats.com/exper25.html . Cliff Jacobson had no difficulty on the Snake [Fels]. But [Fels] also reports severe damage on the Parent (Coppermine tributary) due to pushing; they tend to buckle. Many paddlers found the seats on models produced before 2006 or so uncomfortable. Daniela and Doug used them as purchased. Marilyn, and Stephen & I, made our own seats following Jim Mandle’s design. She had no problem, but we deviated by substituting wooden canoe seats and aluminum tubing (1/16" wall). My weight was too much however and we now use stainless tubing. The newer models (post 2005 or so) have much improved seats. I haven’t spoken to anyone who has them, but I’m sure thinking of buying them. NB: Nearly all the following is from 2005. Note: Plastic is less useful for paying for things than it is down south; don't expect to be able to use credit or debit cards. Campground: I’ve heard of paddlers staying there but don’t have first-hand information; I don’t know that it accommodates tenters. Check the map provided for each B&B for the location. In 2005, we stayed at Island B&B (near the float-plane base) and at Ptartan Ptarmigan B&B (downtown); we were happy with both. Many paddlers like to stay near the float-plane base (and so near the Wild Cat), which is something like a half-hour walk from downtown. As far as I know, the B&Bs that qualify are Island, Bayside, Back Bay Boat, Captain Ron's, Blue Raven and Gill Power. Ptartan Ptarmigan, Embleton, Dreamcatcher and Jam’s are downtown. Other B&Bs that I know of (and I think are on the other side of downtown from the float-plane base) are Anita's, Arden Avenue, Eva and Eric's, For the Birds, Gitzel House, Lower's Landing, and Tessa MacIntosh. NB: Except where noted, all the following is from 2005. Baker Lake's economy is based on cash. Cheques are often accepted; don’t count on being able to use a credit card; don't count on finding an ATM; don't expect to be able to use debit cards. The same likely holds for Rankin Inlet. Baker Lake is dry. The main store has limited hours; there's a great museum, a community centre and craft stores; why not contribute to the local economy? Located about 2 km west of town, toward the airport, it has four tent platforms, rudimentary toilet facilities and a cabin that will sleep four. We stayed there one night after our 2003 Kazan trip; it's a nice way to meet local people, especially children. The web site lists the hamlet office number 867 793 2874 in connection with the campground (to reserve?, to alert people that paddlers are coming and to open up the cabin?). Cabins: Sleep 3 in comfort; bathrooms outside somewhere; $75 per person per night; no minimum number of people unless lodge is busy. We stayed there in 2005 and recommend them. Lodge rooms: $120 per night single, $200 per night double; bathrooms en suite? The lodge provides courtesy rides to airport. 888 866 6784 or 867 793 2801; unsure phone numbers are current; the website http://www.bakerlakehotel.com was functioning in late October 2008. One web site lists 17 doubles, 4 singles and 4 suites, another 5 suites and 20 twin-bed rooms; $185 per person per night. Added to the list in 2008; click on the WheretoStay link above. I assumed that the lake was named for one or both of the Fidler brothers (John and Henry/Harry) on Anderson’s 1855 expedition. It occurred to me later is that it might have been named for the surveyor and explorer Peter Fidler (1769-1822) (who certainly did not visit that part of the country, for Back would have known in 1834 of the river that now bears his name). BTW, Toporama gives five Fidler Lakes in Canada, two in MB and one each in ON, SK and NU; there’s also Fidler (unincorporated area in AB), Fidler River (ON), Fidler Bay (SK), Fidler’s Hill (ON), Fidler’s Island (SK) and Fidler Point (AB). John (b-c1825) & Henry FIDLER (1831-1908) were half-brothers, sons of Thomas Jonathan FIDLER (1795-1875). Peter FIDLER of Bolsover (1769-1822), HBC surveyor, explorer and fur-trader, was their grandfather. John FIDLER was a canoe-middleman during Dr John RAE’s expedition of 1850-51. On Feb 19, 1853, Henry FIDLER agreed to join Dr RAE's Arctic Expedition of 1853-54 as a middleman and laborer. He accompanied RAE as far as Chesterfield Inlet and when arrangements had to be made to winter at Repulse Bay he was one of the men sent back to York Factory. His share of the Government's reward made to Dr RAE for first ascertaining news of the fate of Sir John FRANKLIN's Expedition amounted to 30 pounds. Both John (as a steersman) and Henry (as a middleman) were with James Green STEWART & James ANDERSON on their journey down Back (Great Fish) River in 1855. I haven’t seen anything connecting John or Henry to ‘Fidler Lake’, but if there was a link it would most likely be one of them rather than their grandfather (Peter). Our companion for several days on the Back died kayaking earlier this year. Hans Baumgartner called me this morning to fill me in on the details. He is finding it very hard, especially as he was the one who pulled Hans from the water and tried to resuscitate him. He's sending me a CD with the photos of their Back River trip last summer. I'll bring it to our Georgian Bay weekend. I've also sent our condolences to Lydia Schneller, and received a short (and heartrending) reply back from her. Hans died of a heart attack while paddling on a whitewater river in the Bavarian Alps with Hans Baumgartner and other friends. His boat overturned in a quiet stretch of water, and his friends were unable to revive him. There was no water in his lungs, so he had died before the capsize. Would you please forward this to George Luste. I'm sure he'd want to know. We met Hans on the Back River in July, 2005. Bad weather had brought him and his friend Hans Baumgartner into our camp. He was unassuming and modest to a fault, quietly introducing himself as ‘a miller’. And then the stories tumbled out, and we began to realize this was one extraordinary miller. One who lived for adventure, not afraid of taking on the most daunting challenges - and of meeting them all with success. We visited Hans in Germany and learned that this humble miller had turned his centuries-old family milling business on the Danube River into the largest and most modern family-run flourmill in the country. His large collection of vintage sports cars showed us yet another side of Hans, and we learned that his second love, beside the Canadian arctic, was the Sahara desert, which he explored every winter in jeep safaris with his friends. In his wife’s sporting goods store, on the mill property, we watched as customers were shown into a comfortable office to discuss their upcoming trip over a glass of champagne with Hans and Lydia. Adventure was a noble pursuit for the Schnellers. Hans was a true gentleman of the old school, an innovator, an elite sportsman and a phenomenal human being. We are so sorry for his loss. Turn his vision into reality. you need the profound experience of being alone. you are practically always alone. Many live a quiet life in order to ease the transition to death. A long life is not the most important thing. what all you can experience in the time you are given. 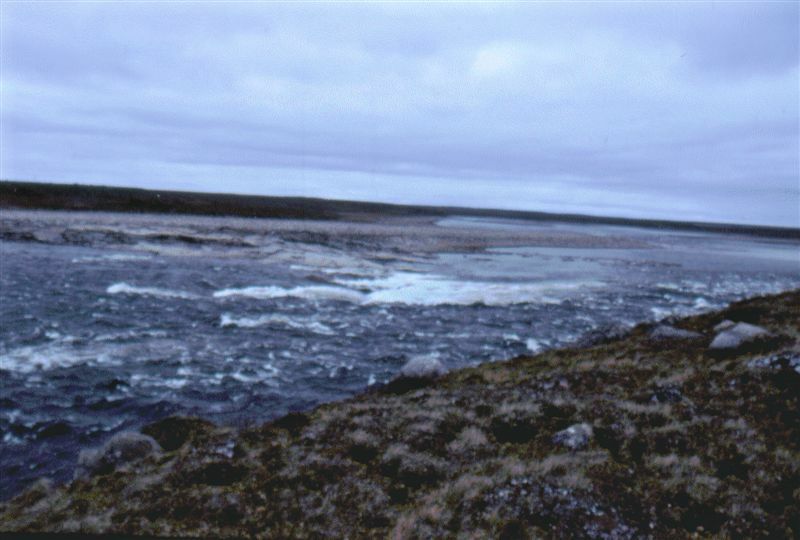 First rapid below Jim Magrum Lake; 6 July 2005. Lower part of Beechey cascades, from the end of the portage. ... an awful series of cascades, nearly two miles in length, and making, in the whole, a descent of about sixty feet. 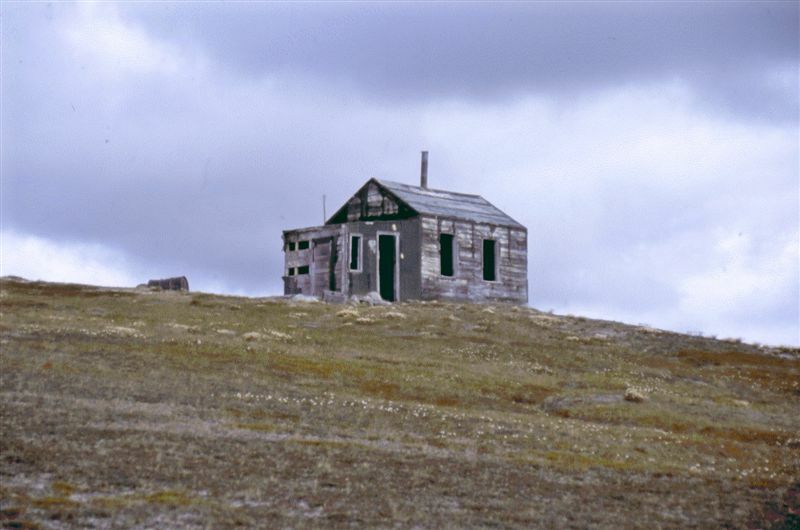 Father Buliard's cabin on Mission Island, Upper Garry Lake. Father Buliard disappeared on 24 October 1956; he had gone out to visit his fishing nets. His body was not found. There is no evidence that his death was anything but an accident and this was the finding at the time. Only years later did the unconscionable, indeed scurrilous, rumours start to circulate that he had been murdered by the local Inuit. These rumours continue to see the light of day even now. I tried to capture the spooky feeling I had when looking at the cabin. 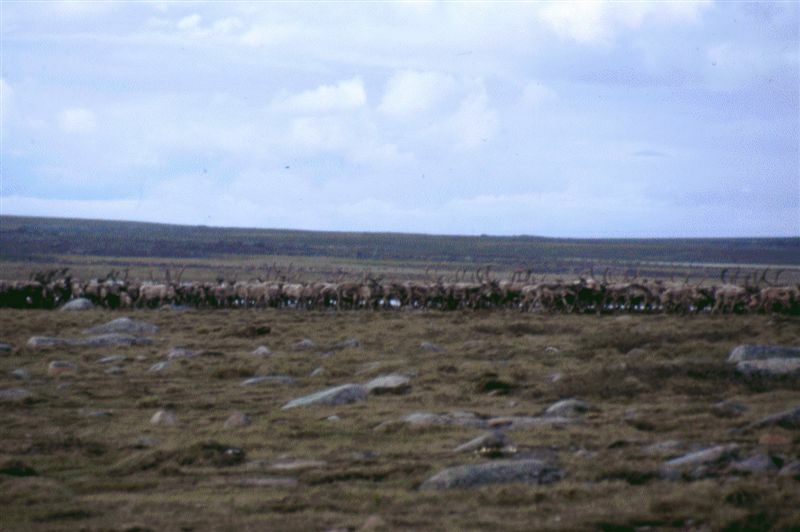 A caribou herd 3,000 to 4,000 strong passing our campsite about 2/3 of the way through Rock Rapids. It was followed shortly by a wolf. 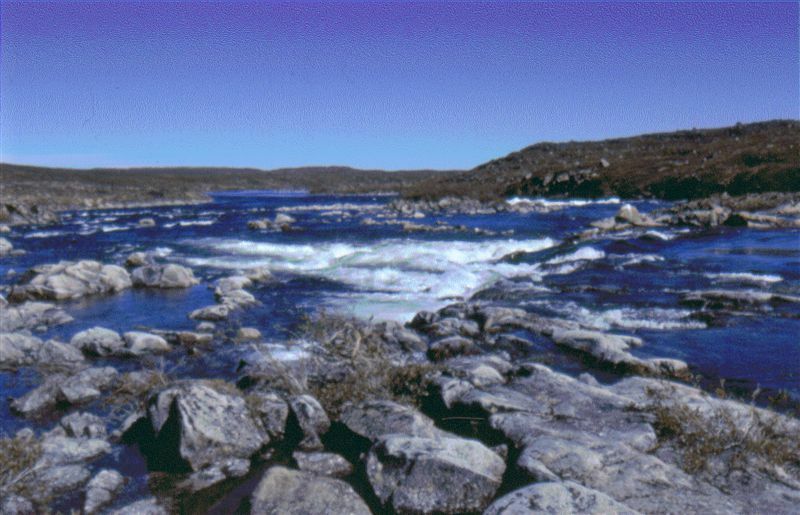 Lower part of Escape Rapids. good enough reason for the name Escape. Is this a time for praying? Pull your starboard oar. File comment: Upper Garry Lake, looking south from Mission Island. George Back, on entering the lake, after battling through ice on Pelly and no doubt expecting more: "... to our chagrin and annoyance, we soon again found ourselves in a wide indefinable space, studded with islands of sand-hills ..."
Thanks for the great TR - I really appreciated the integration of the '05 trip with the journals from the past. Replying from Quito Ecuador after three weeks in the Andes \mountains. We flew out from the Ellice River to Cambridge Bay. you got to the main branch of the Ellice, it was beautiful. I've added that information to Appendix B.
I might add that folks can reduce exit costs considerably from the Back River by paddling to Baker Lake. A number of paddlers have done that over many years before I did and there is more than one overland route south to the Thelon. In 1999 on a solo trip I went up the Meadowbank River from the Back and then south to the Thelon. It's a bit of an uphill slog because the Meadowbank is not a good drop-and-pool river but with the open barren country it is not that bad. And travelling more slowly makes you appreciate the landscape more. Can you be more specific about your route from the headwaters of the Meadowback to the Thelon? The Borealis group went that way, though in the other direction if memory serves me right. I don't recall that they specified their route either. Of course the native people would have also have transferred between those watersheds. I have stuck in my head that there are many evidences of their passages. Is this right? Allan: I don't have my maps handy but from the 50,000 series topos it seemed rather obvious. I simply tried to minimize the overland walking distances in my planning. I had no prior information. At the top the flow was minimal. Thus there were several grunt portages. At the end I left the stream and came down a big hill to the Thelon - downstream of Schultz Lake. In several places on the Meadowbank I found remains of modern campsites - of Inuit from Baker I'm sure - even a small cabin on skids that must have come in via skidoo. I've heard of others going overland from the Back to the Thelon west of the Meadowbank as well. Not sure what exact route was taken. Added a bit later. I found my 1999 diary. It has me leaving the Back on July 29. I was windbound for 3 days on a shallow lake at the height of land and reached the Thelon River on August 8. Total distance from the Back to the Thelon was estimated as 225 km. I looked at the maps several years ago and as George Luste stated, the route is fairly obvious. It is easier to work backwards. Off the top of my head, follow the Thelon upstream from Baker Lake to where it swings west. Look for a creek heading NE. Follow the creek and the chain of lakes (NNE) till you see the headwaters of the Meadowbank. I opted to avoid the big pipe (the thelon) and instead try out the route from little used meadowbank to prince (to baker). It really was not that tough, work yes, impossible, far from it. Looking at the maps you should be able to see a couple of 'clear' routes. As George stated, the land is open, which helps. I'm not sure if the new mine in the area has changed anything.